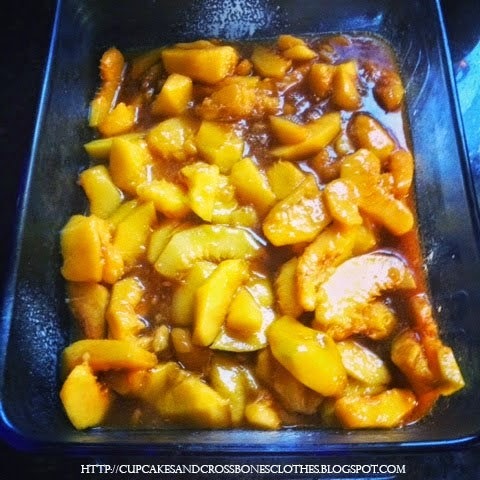 If you follow Cupcakes & Crossbones on Instagram you probably saw that I was busy in the kitchen baking up some yummy peach cobbler this past weekend. This wasn't just any peach cobbler though. This sweet treat was made with peaches picked from my peach tree in the backyard. Not only is this cobbler delicious, but it was super easy! P.S. If you are not a peach person, just substitute peaches with apples for something just as tasty, apple cobbler! -Bring your mixture to a boil and cook for 1 minute constantly stirring the peaches and what is now a caramelized mixture of goodness. 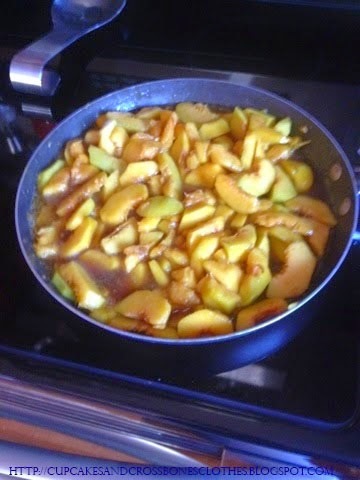 -Remove your caramelized peaches from stove and pour the entire saucepan into your prepared baking dish . -Drizzle the other 1/2 cup of butter (melted) over the cake mix. -Bake for 1 hour or until top is lightly browned and bubbling. -Serve warm topped with vanilla bean ice cream. This was a hit in my home and I know it will be in yours too! Do you like peach cobbler? Is this something you would make in the future? P.S. DON'T FORGET! head over to Friday's post for your chance to win a free Fleurty Bands headband! Yum!!! I've never attempted to make Peach Cobbler but this looks so do-able!! This looks so yummy. Love a good cobbler and from your own tree no less! It was delish! 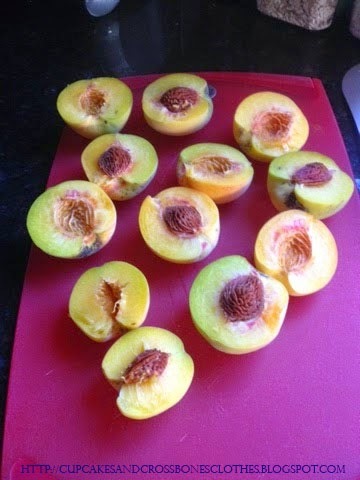 My peaches on my peach tree were stunted for a while and for some reason this year they came in full and juicy so I knew I had to pick a few and make something with them! I LOVE COBBLER! YUM - another one of your recipes that I will be eating - in 11 days HAHAHA! Haha! I may just have to make you be the offical taste tester! 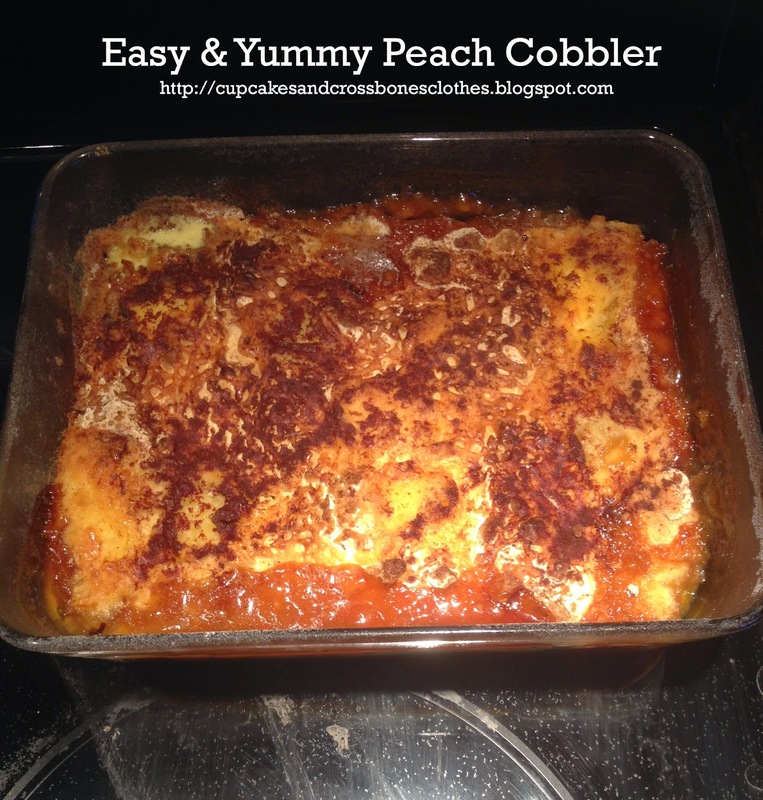 I have never had peach cobbler, it looks yum!